I’ve never been much of a hunter. Living here in the deep south, that’s almost an unforgivable sin. I just have never seen much sport in shooting a defenseless animal with a high-powered rifle. I think an argument could be made hunting with bow and arrow. You have to get up quite a bit closer to game than you would with a rifle. But, even with bow and arrow, I don’t get it. Unless it’s for food, and you don’t have anything in the freezer, I just don’t see the sport in hunting. But, that’s just me. I don’t condemn those that see hunting as sport. There is one deer hunter in Sedalia, Mo. who might agree with me today. Randy Goodman shot a nine-point buck with two well placed shots…or so he thought. After making his second and final shot at the buck, Randy walked up to the buck to inspect it for the prized antlers and how they will look in his den. Only thing about it…those antlers suddenly turned on him. The buck was not dead. 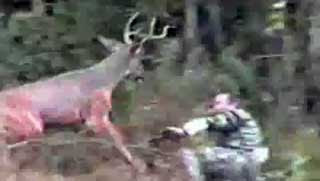 Randy had to fight the buck for about 15 seconds with the buck trying its best to kill the man. After bloodying the hunter, the deer took off. But, he didn’t get far as Mr. Goodman fired two more shots into the valiant deer. The deer hunter was treated for scalp lacerations and a slight concussion. I don’t begrudge a man’s sport. 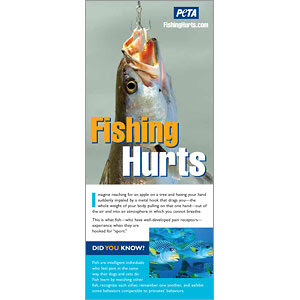 PETA is even up in arms about fishing these days. But, in the case of fishing, the vast majority of the catch is eaten. I suppose the same could be said of deer killed during the season. But, I really believe the biggest motivating factor of deer hunting is getting those antlers as a trophy in the den or living room. However, in this case, it was almost Mr. Goodman’s scalp that ended up on that antler trophy. If ever there were a case of the hunter becoming the hunted, this one was it. It's pretty sad to see mankind treating animals as some kind of entertainment. Erwin, it is shameful that animals are still used for scientific experimentation. That is outrageous when you consider they same results can be had by computers. Thanks for the comment.